Hello, there! Something is fishy around here today, in case you weren’t aware. 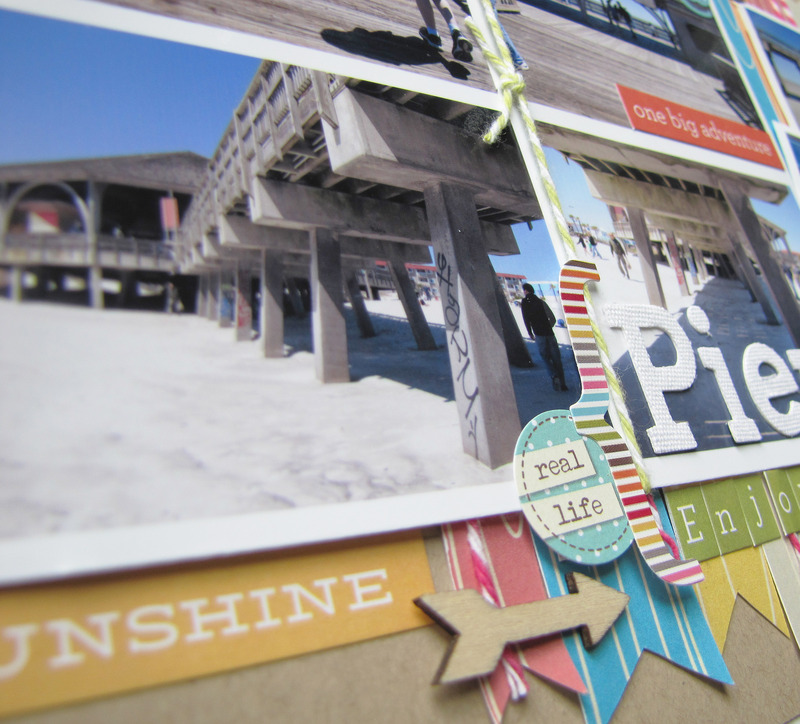 The Pretty Paper, Pretty Ribbons design team is having a blog hop and you’re invited! You’ve been hopping/swimming along already? Great then you should have you come here from Nicole’s blog and you are in the right place. If you just stumbled upon this post and would like to start from the beginning, please visit the Pretty Paper, Pretty Ribbons blog to get you on your way. 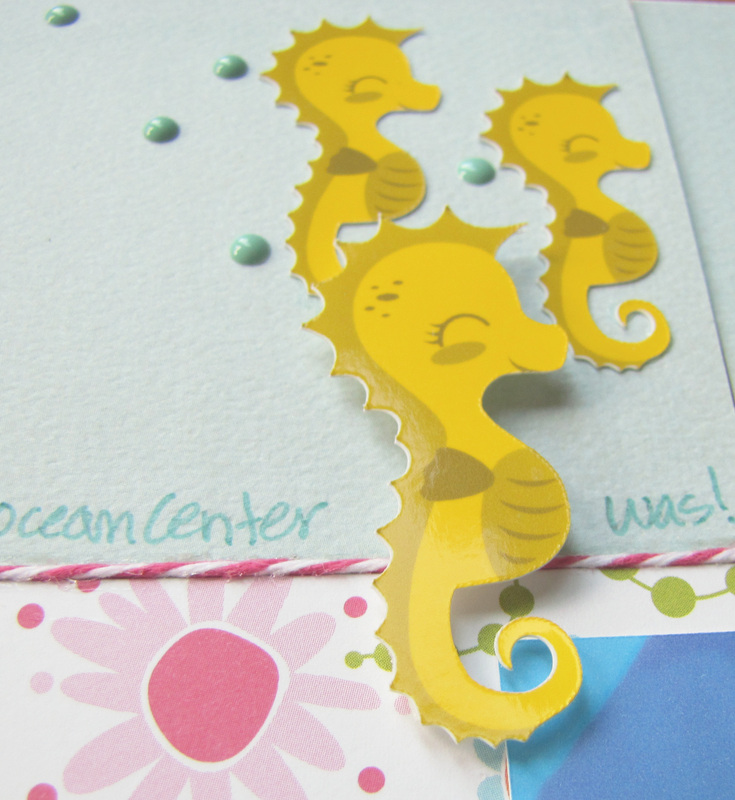 I used: Fishy Friends Cutting Files (hammerhead) , Sea Life Cutting Files (turtle and sea star), Jellyfish Cutting Files, Porthole Card Cutting Files (which has a whole lot of detail that I didn’t use, but instead just cut off the back and left the center open) and Sweet Seahorse Cutting Files. I can’t say enough how wonderful it was to have the option to do print and cut with these! With some of the features being so small or just the creature being small, it was awesome to have all the colors and layers ready to go with print and cut. So you wanna keep hopping? First a few more details about the hop! The blog candy for this hop is a $15 GC to the PPPR store. For a chance to win, you must be a follower of each blog and leave a comment on each blog. For extra chances, you can also “LIKE” Pretty Paper, Pretty Ribbons on Facebook and/or sign up for the Pretty Paper, Pretty Ribbons Newsletter. A random winner will be chosen for the prize on Tuesday, July 14, 2015. 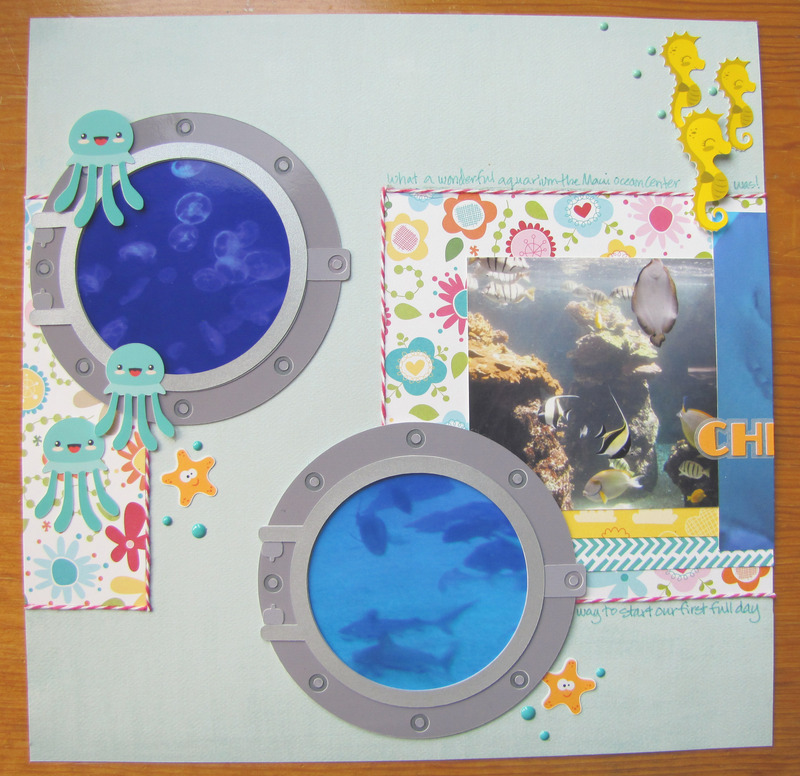 We hope we will inspire you to join in with the Under the Sea challenge. Check out all the information on the blog, here. One random participant will win $20 to PPPR. Thanks so much for visiting today! 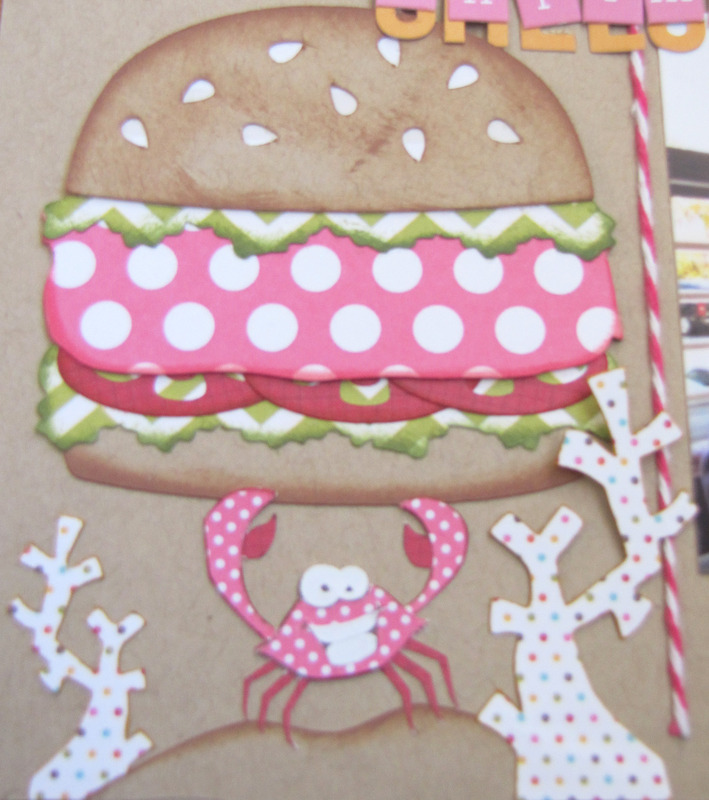 Please head on to Sarah’s blog and check out her fun card! Ruth ~ You are here! I loved it! It was just what I was looking for – 2 pages and with circles! Thanks so much Scrap Much? and Laura Whitaker for this awesome sketch! 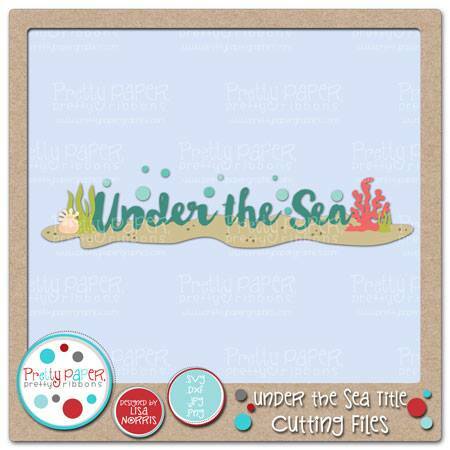 Cardstock – Recollections; Patterned Paper – Bella Blvd, Carta Bella; Twine – The Twinery; Marker – Close to My Heart; Enamel Dots – Freckled Fawn; Adhesive – ScrapPerfect, Xyron, Zig. Hi and welcome to my blog! I sure hope you’re having a great day! 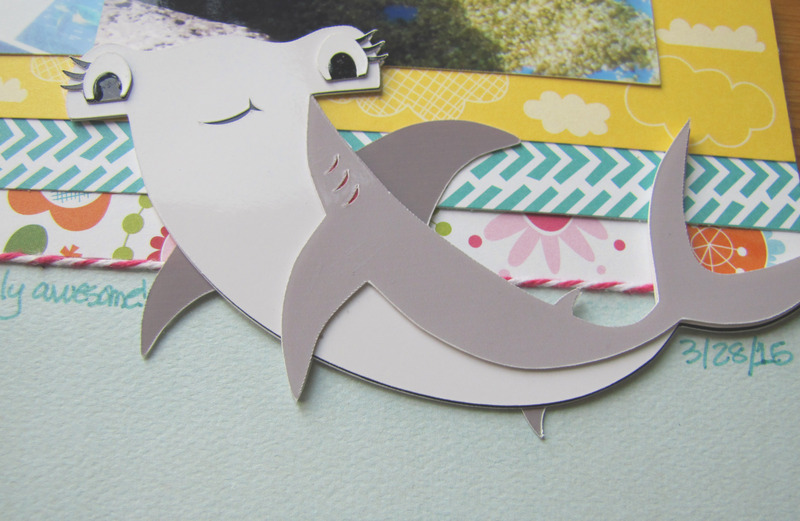 Although it’s a Saturday, I’m one busy lady all day today, but I had to show off my project and share all about the fun going’s on at Pretty Paper, Pretty Ribbons, so here I am! 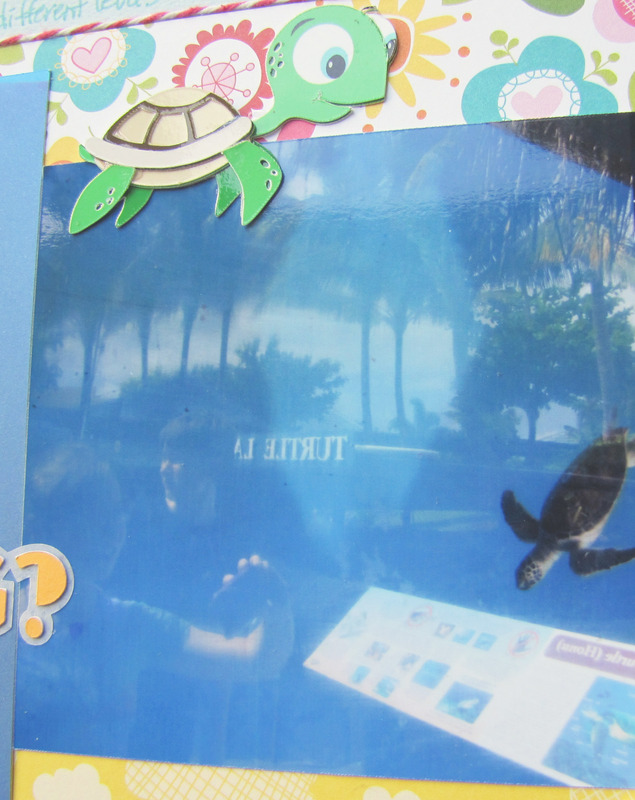 If you came here from Nicole’s blog and are hopping along, you are in the right place. If you just stumbled upon this post and would like to start from the beginning, please visit the Pretty Paper, Pretty Ribbons blog. The theme for this hop is Get Cookin’. 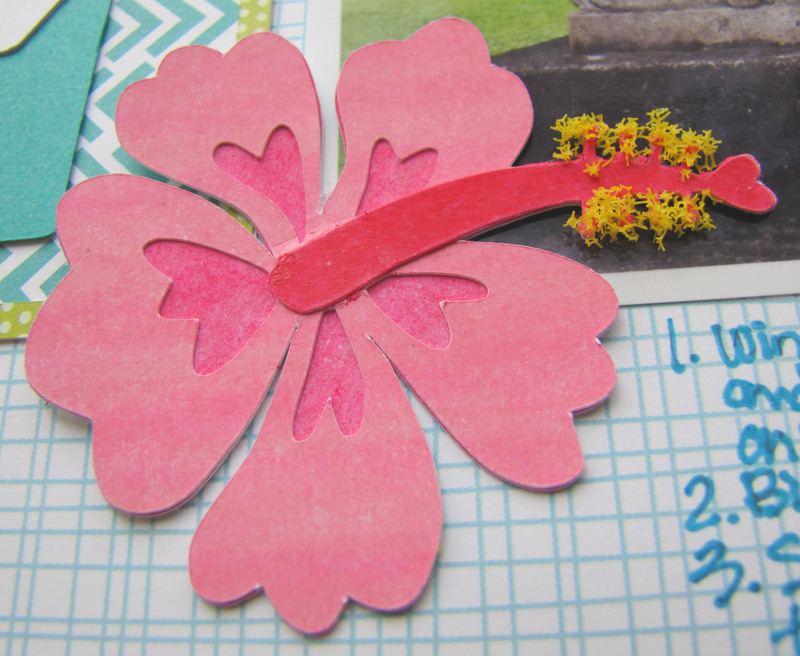 We’re sharing projects that have to do with cooking and food using Pretty Paper, Pretty Ribbons files. There is so much to choose from in the store – it was tons of fun picking out how I was going to Get Cookin’! I think this crab is so happy that I didn’t choose him for my lunch! Isn’t he the best? He’s from the Moody Crab Cutting Files and I have to smile when I look at him! He’s standing on a bit of the sand from the Day at the Beach Cutting Files and the coral comes from Fishy Friends Cutting Files. I’ll share the details on another cut that I used from that file in a moment. 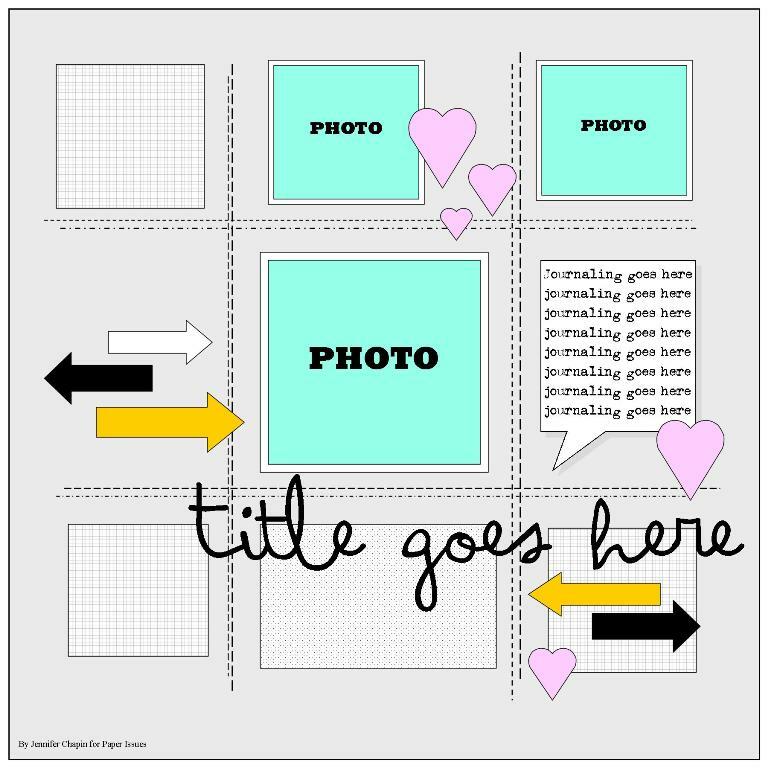 I used the Speech Bubbles Cutting Files to create the journaling block – a favorite for me. You may have noticed some drawn bubbles as well. 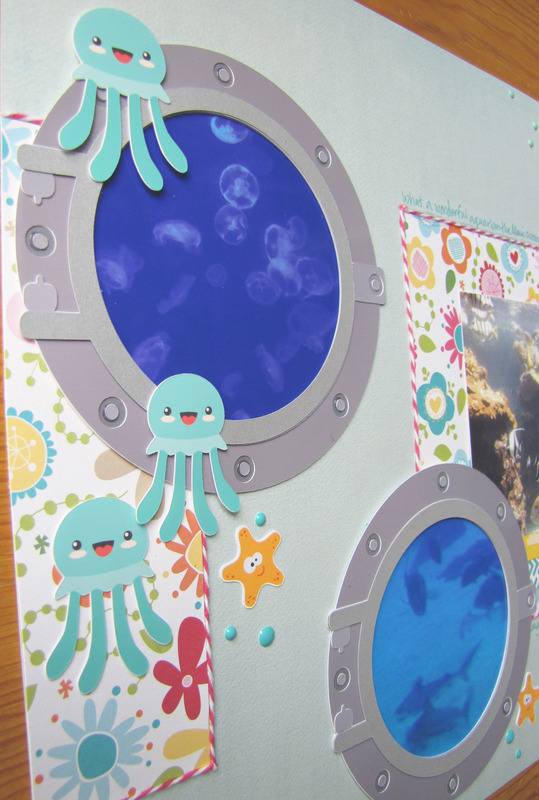 I used the bubbles from Fishy Friends Cutting Files. I deleted the background cut and used the Silhouette Pen Holder adapter along with the Silver Wink of Stella marker to draw them with my Silhouette machine. Then I used some green enamel dots in some of the bubbles and some Liquid Pearls on some of the others. I love getting more dimension out of my page my having something drawn or stamped on my base layer. I think it adds a lot to my page. 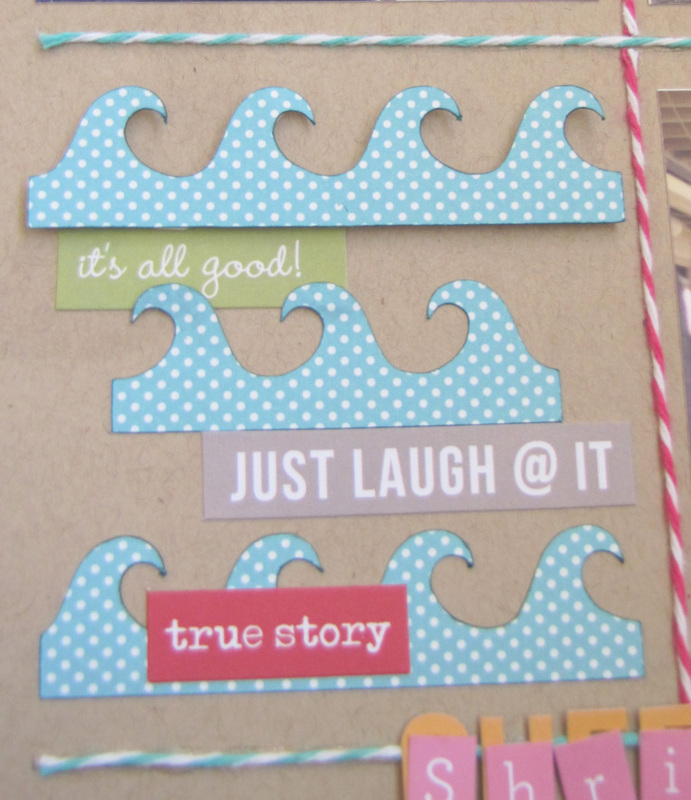 Next we have some waves – couldn’t have a page about dining outside with the ocean in view without these! 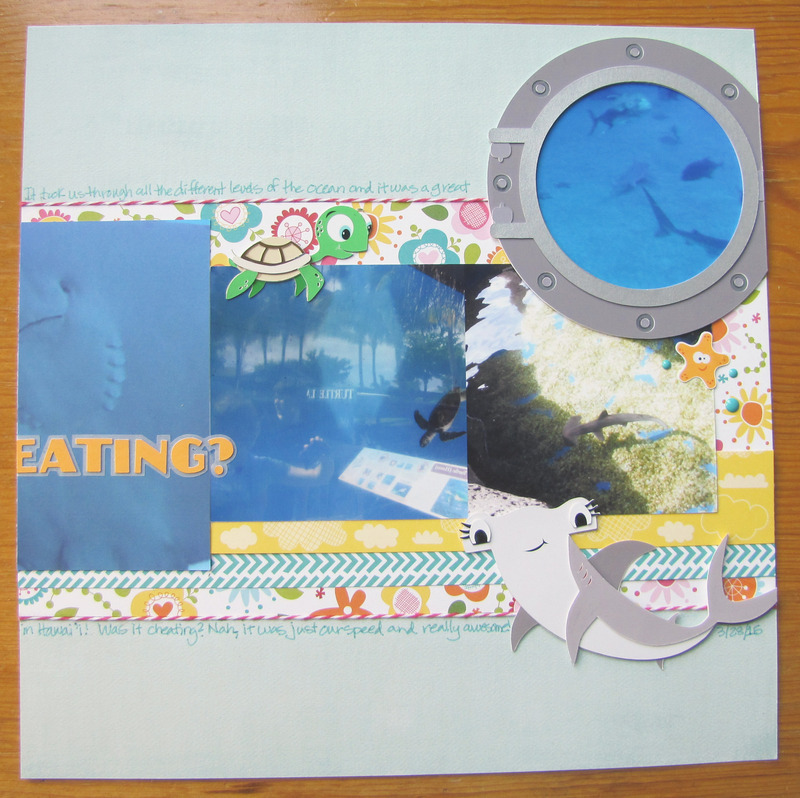 I used the Borders 5 Cutting Files. I reversed one of them to go the other way before I cut, trimmed them down a bit to fit in my grid, and inked the edges with a marker to define the edge. I sure hope you enjoyed my layout as much as I enjoyed creating it! 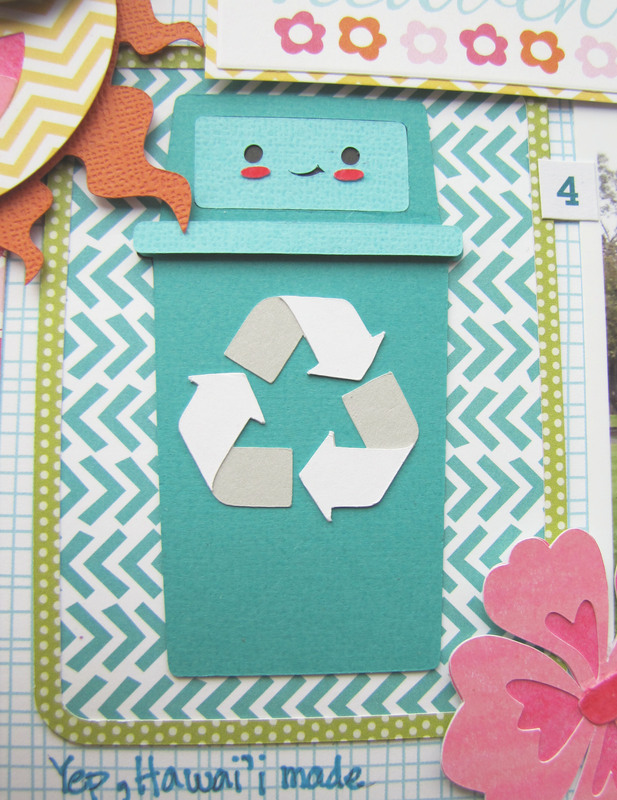 Now on to some blog hop details! The blog candy for this hop is a $15 GC to the PPPR store. For a chance to win, you must be a follower of each blog and leave a comment at each stop of the hop. For extra chances, you can also “LIKE” Pretty Paper, Pretty Ribbons on Facebook and/or sign up for the Pretty Paper, Pretty Ribbons Newsletter. A random winner will be chosen for the prize on Tuesday, March 17, 2015. 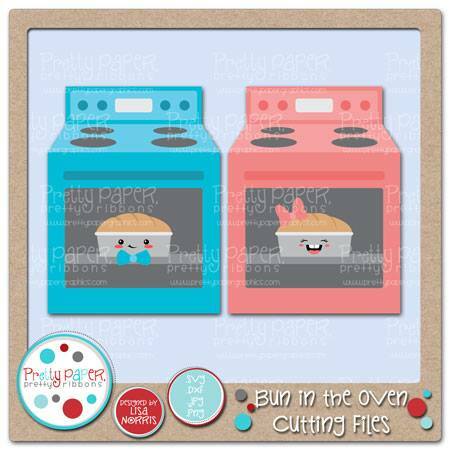 Don’t forget to pick up the Blog Hop freebie, this fun Bun in the Oven file, only free Saturday and Sunday of the hop…after that it will be available for sale in the store. 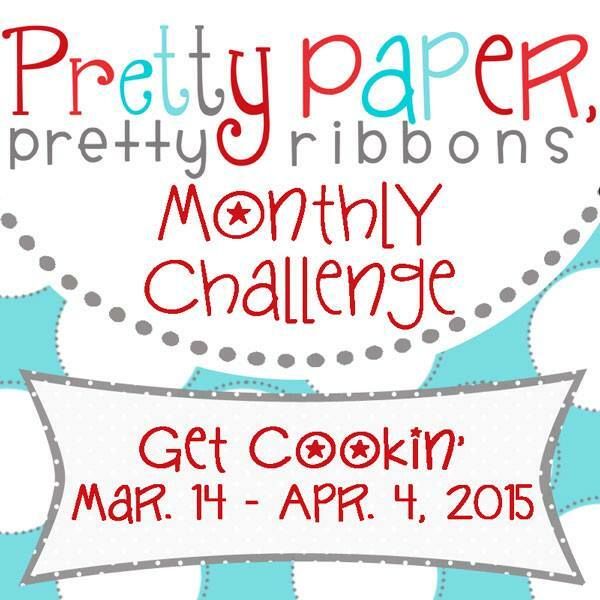 Our hop kicks off the Get Cookin’ Challenge at Pretty Paper, Pretty Ribbons. 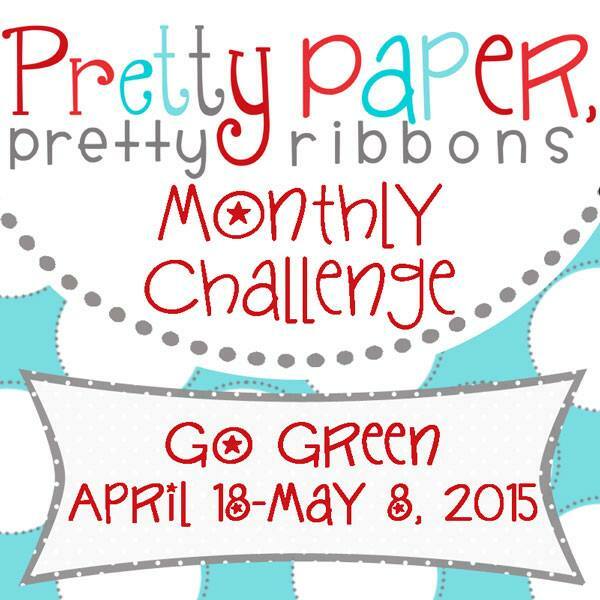 The challenge projects can be any cooking or food related project that features Pretty Paper, Pretty Ribbons files. 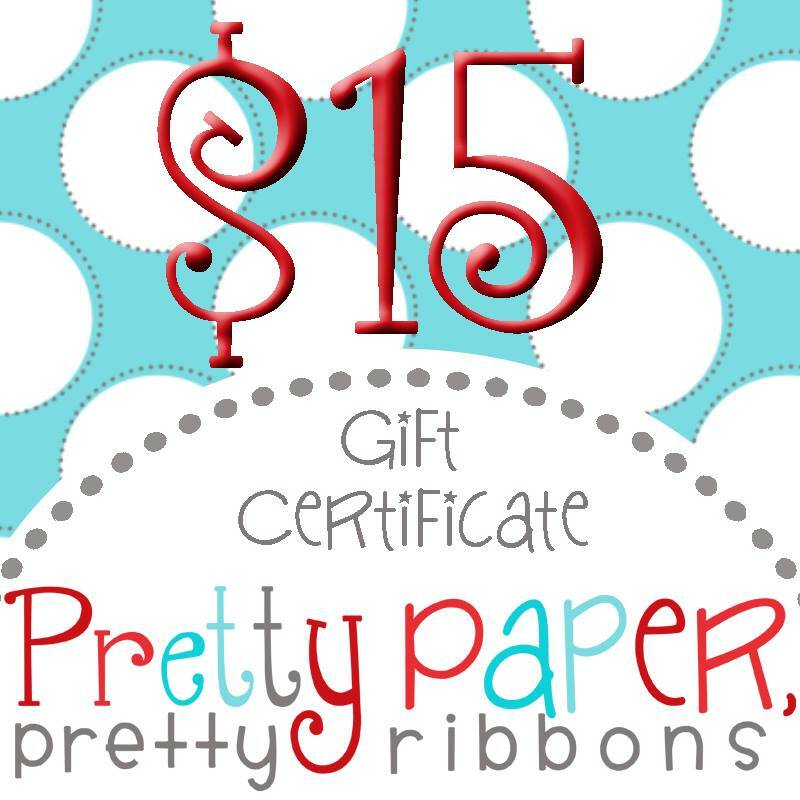 Pretty Paper, Pretty Ribbons products must be the FOCUS of the project and the prize is a $20 Gift Certificate for the Pretty Paper, Pretty Ribbons store. Check out all the details here: Monthly Challenge. I am sure you could cook something up to join in the challenge! I can’t wait to see what you create! 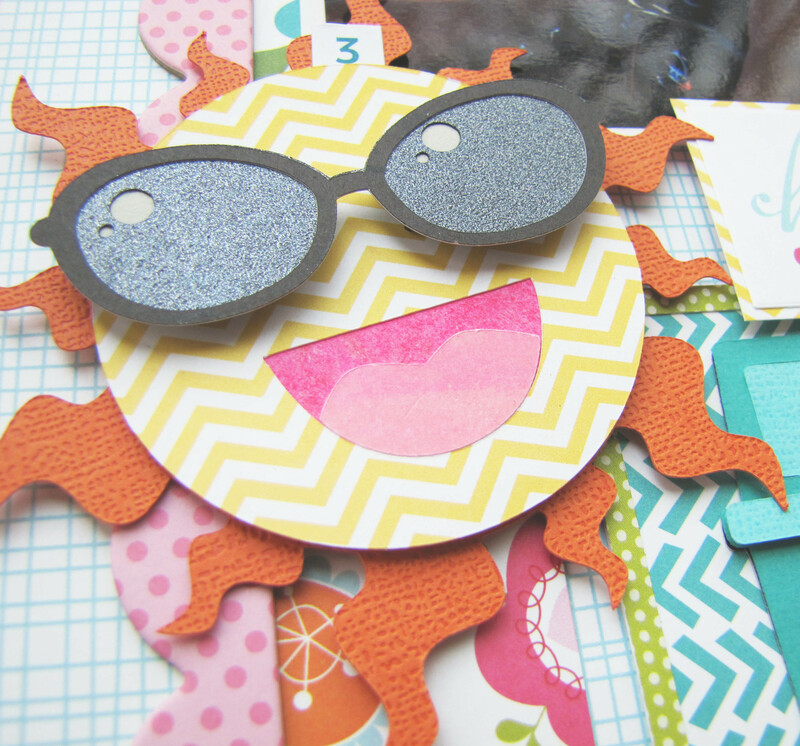 To continue on the hop you’ll head to Sarah’s blog next! Ruth <<<— You are here! Sarah <<<— Head here next! I used deep red, gray, turquoise and dark green. Paper Issues New Issue was: Enamored with Enamel. 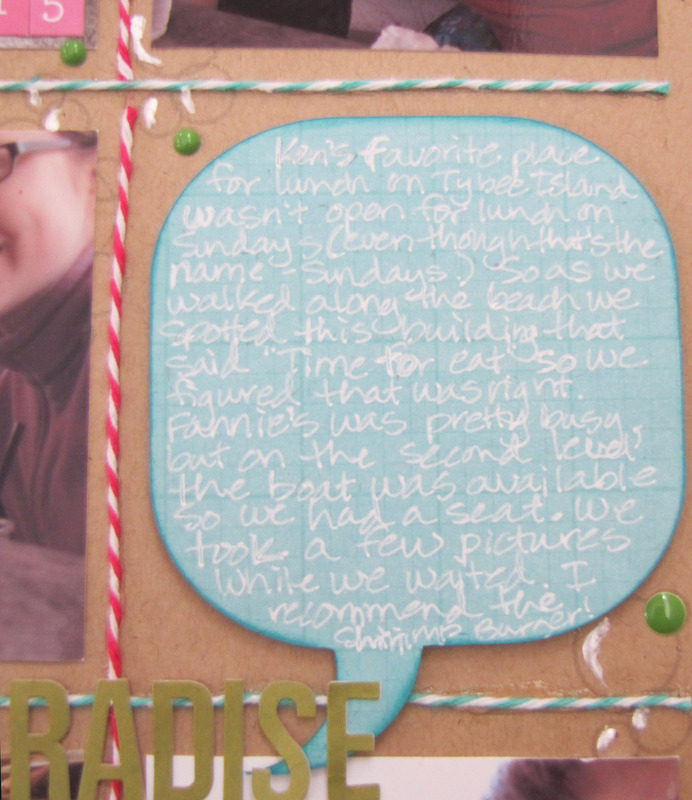 I used enamel dots, plus I’m enamored with vacations with my family and scrapping them! 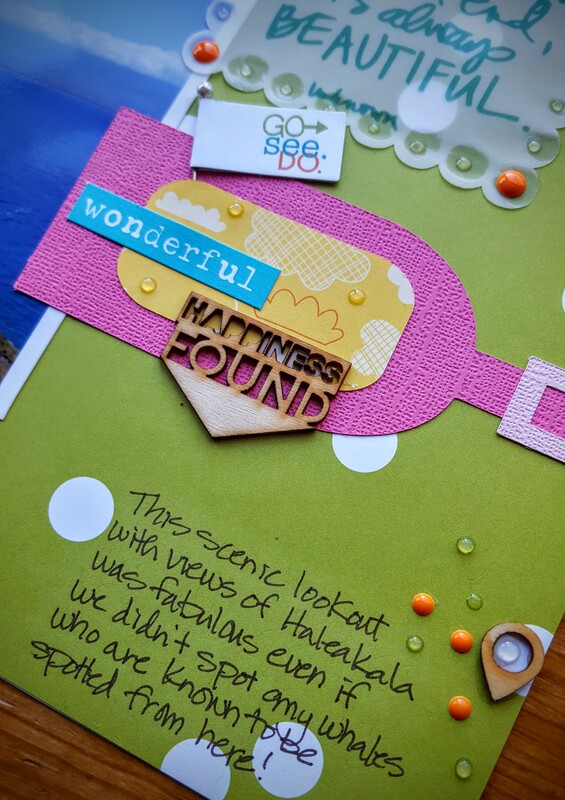 The stitched divisions as well as the spot for journaling were elements I especially loved! 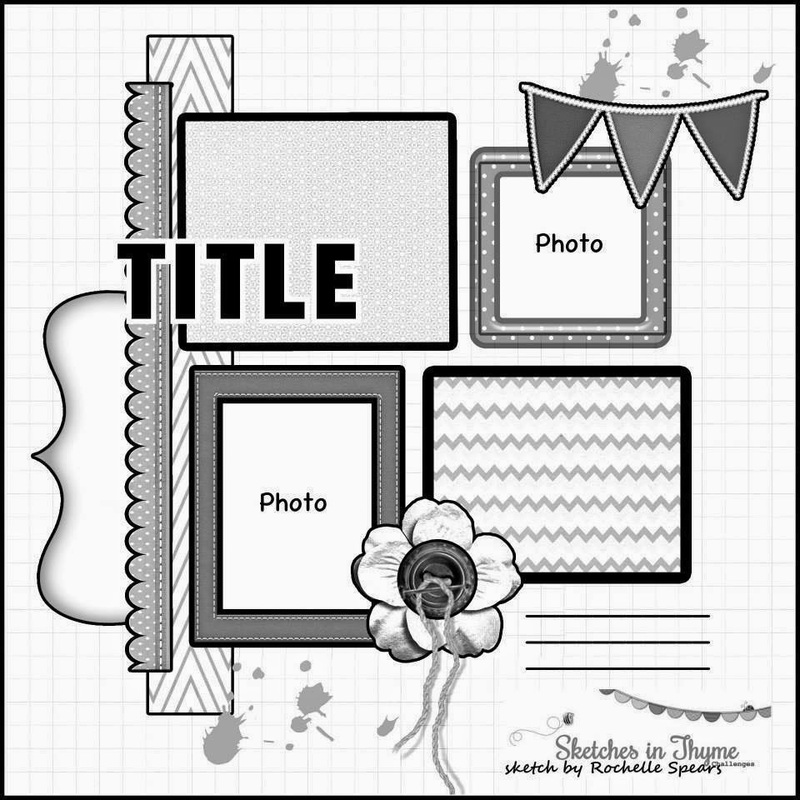 Through the eyes of Rochelle Spears has a March Tic Tac Toe Challenge. 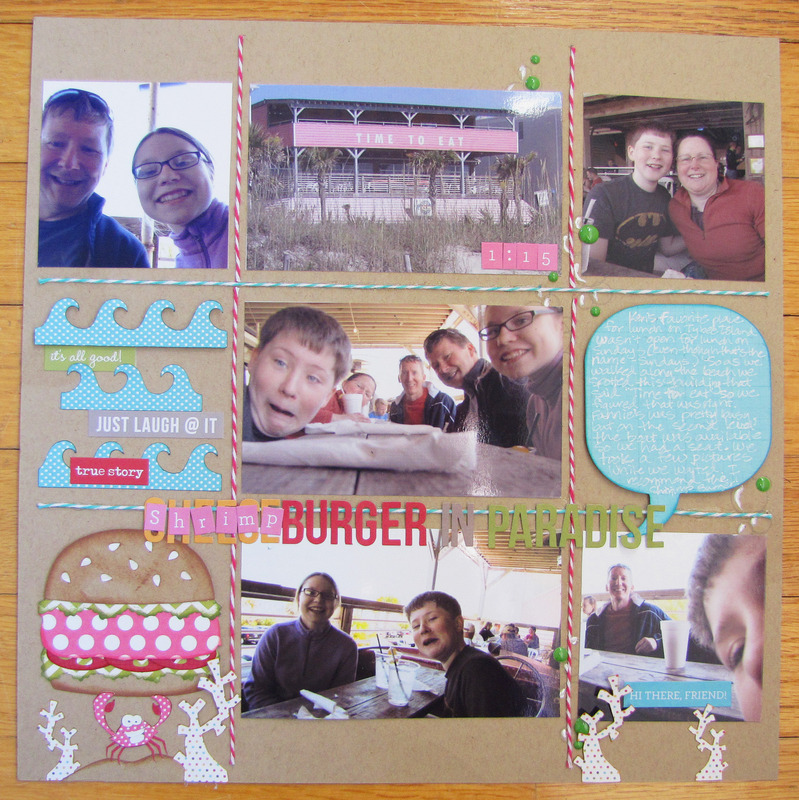 I used the diagonal going from the lower left up to the right: Mini Alphas (Shrimp on title), the color green (lettuce on burger, word Paradise and phrase sticker on waves), and Enamel Dots (going up right side as bubbles). ETA – I definitely had intended to enter this in Lasting Memories “So Happy Together” challenge, because it really was such a happy occasion to visit with Scott’s brother in Georgia! 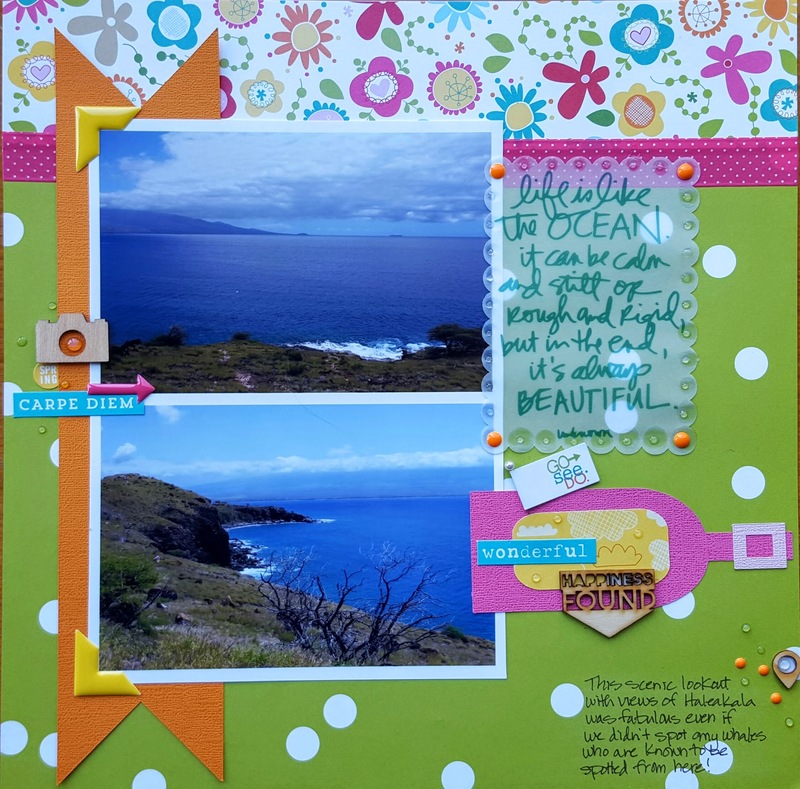 ETA – My layout was chosen as a top 3 for March over at Lasting Memories! Thanks so much for choosing me! Supplies I used: Cardstock – Bazzill; Patterned Paper, Alpha and number stickers, word stickers – Simple Stories; Twine – The Twinery; Enamel Dots – Freckled Fawn; Dimensional Paint – Ranger; Pen – Closet to My Heart, Kuretake, Sakura; Ink – Close to My Heart; Die cut machine and accessories – Silhouette America; Adhesive – ScrapPerfect, Xyron, Zig. As many of you may know or remember, I’ve been working on my Spring Break album on and off. 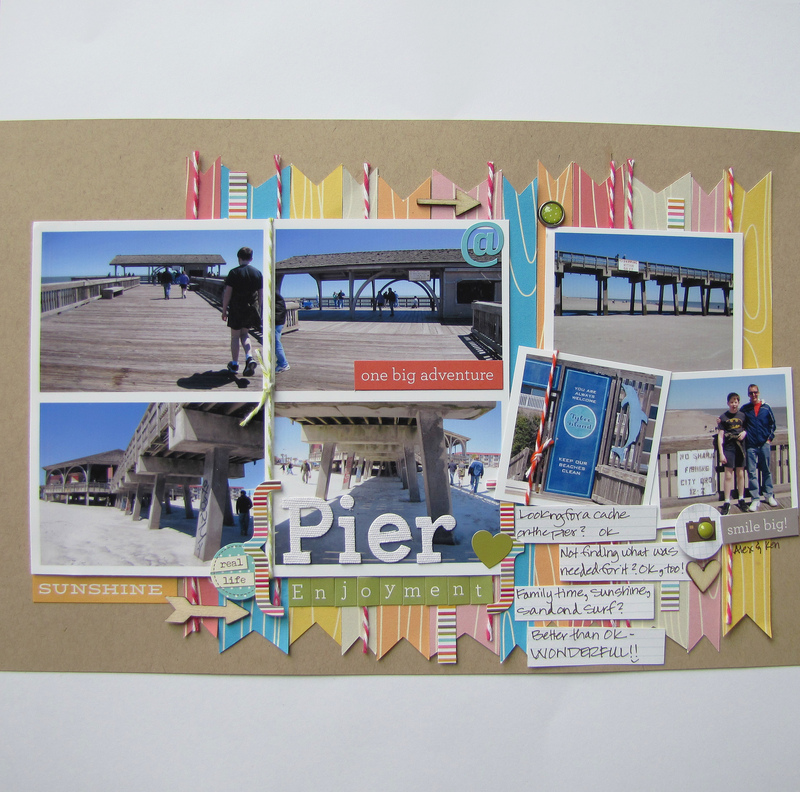 I needed something that would help me create a page for exploring the pier on Tybee Island. I had a number of photos that I loved and really wanted to include them all. Both my hubby and my daughter had taken pictures and shared them with me, so it’s really quite a collaboration of photographers! The banner strips reminded me of the decking of the pier and I felt that there was the opportunity to turn the large photo into a collage so that I could show 4 different pictures in that spot. 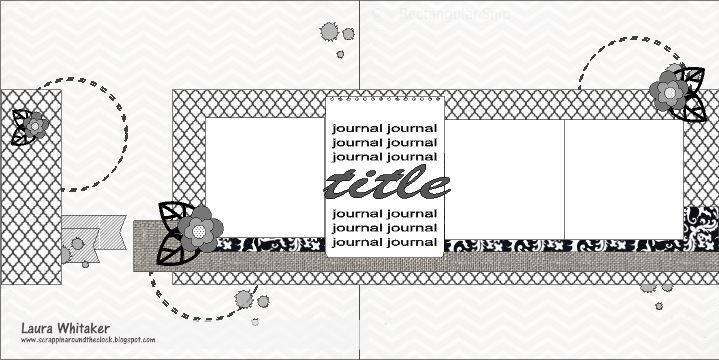 I always like to see a spot for journaling and of course a few fun embellies! 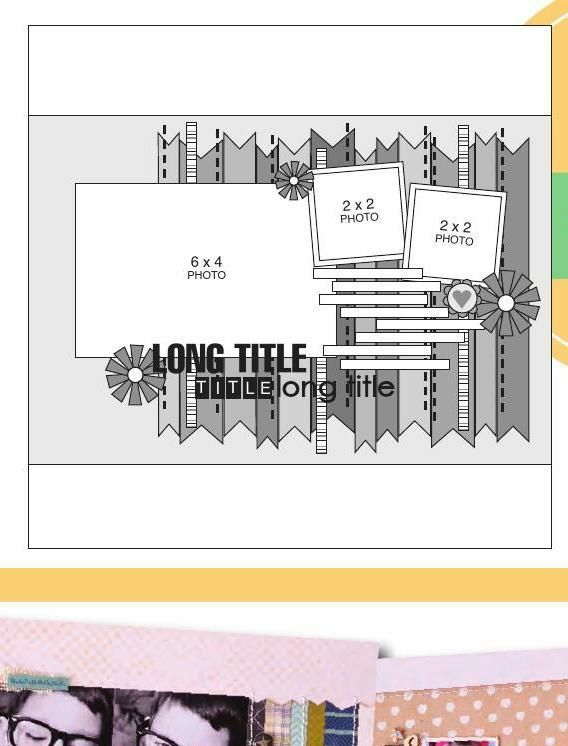 So the story is that I printed my “decking” pieces on my printer from a digital paper from Pixl Cafe (WoodgrainPapers-TMartin), just on regular cardstock, I cut them out with my Silhouette using Flag Borders (from Sweet Afton) adapted to work with the sketch sizes. Did I explain that the sketches from Scrapbook Generation come with sizes for all the major elements? Well, I should have because it makes it even quicker and easier to create a layout close to the sketch design without having to try and guess! I decided to use some twine for the stitched lines as well as a few other places. 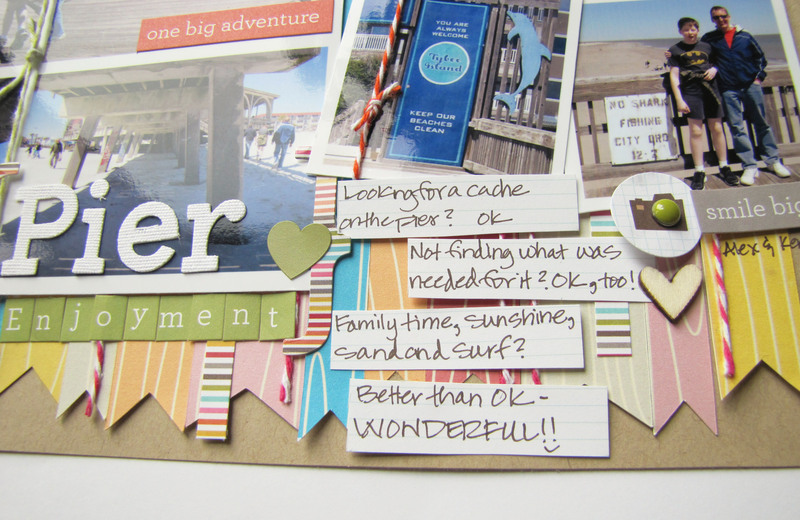 I thought it went nicely with the beach/pier theme. 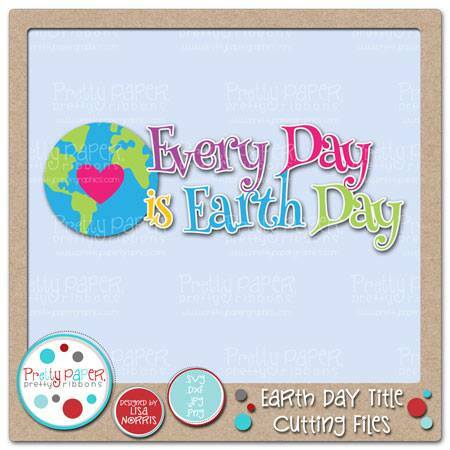 Yep, there are a few wood veneer elements (Studio Calico), some brads and stickers (Simple Stories) along with the paper strips and the paper I used for the journaling strips (also Simple Stories). 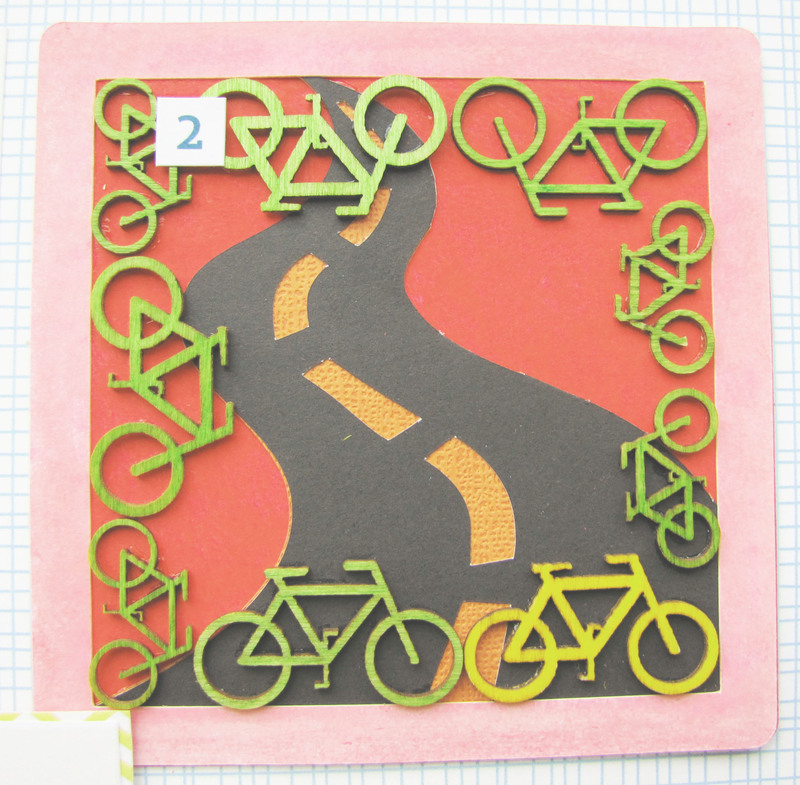 The “Pier” alphas are canvas letters from Little Yellow Bicycle – I think they went perfectly with my theme, too! Thanks so much for stopping by! I love to read your comments and hope you’ll visit again soon! 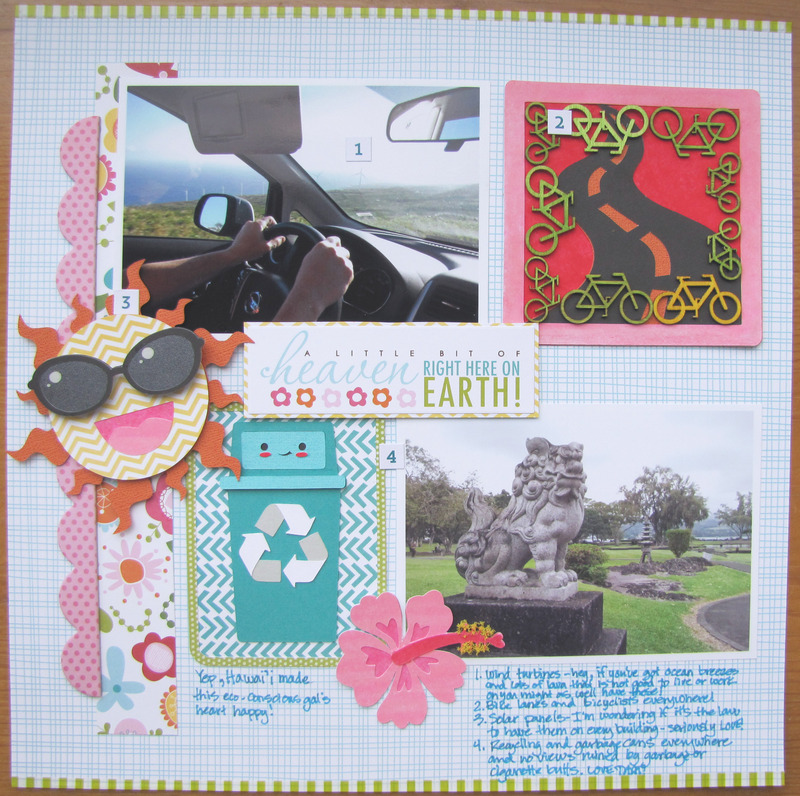 I’ll be entering this layout into the Simon Says Stamp Anything Goes challenge for the Wednesday Challenge blog. Have a super happy kind of day!